Leviathan's technology significantly increases the power output of existing wind turbines by directing the surrounding wind flow to the critical area of the blades by designing a unique structure near each turbine. This passive device increases both average power and revenues by around 20 to 40% of all large wind turbines. The Wind Energizer changes the world's wind map, making millions of new square kilometers available for wind farms. Welcome to the home of Leviathan Wind Energizer LLC, providing a game-changing technology for the wind industry. What technology can improve wind turbine performance by around 30%, and sometimes 150%? How do we do it without touching the turbine? 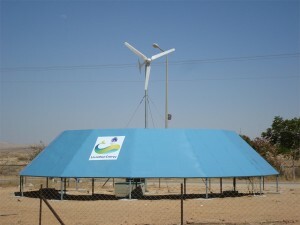 To get the answers, Click Here to read about our innovative wind energy product. What is the fastest way to increase the amount of renewable energy in the world? The Wind Energizer, of course. Click Here to understand why. The Wind Energizer™ is a passive aerodynamic structure that partially surrounds the base of the windmill from a calculated distance to increase the wind speed flowing through the rotors of the turbine.